CATCH THE DREAM! Full of onstage joy and backstage drama, the sensational new production of DREAMGIRLS tells the story of an up-and-coming 1960s girl singing group, and the triumphs and tribulations that come with fame and fortune. 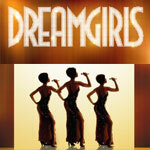 With music by Academy Award nominee Henry Krieger and book and lyrics by Tony and Grammy Award winner Tom Eyen, DREAMGIRLS features the unforgettable hits: "And I Am Telling You I'm Not Going," "One Night Only" and "Listen." This Tony and Academy Award winning musical sparkles like never before!